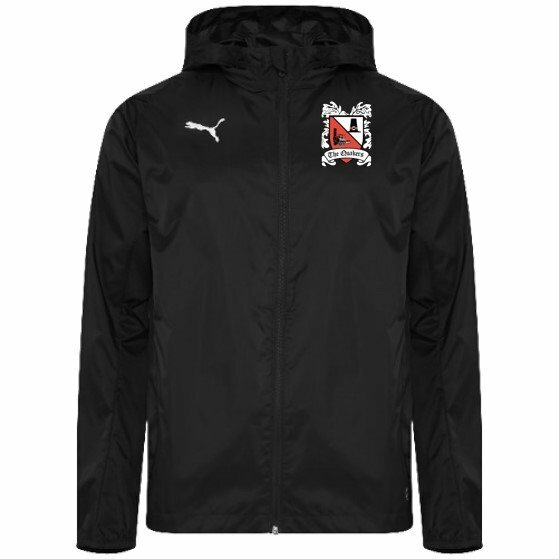 100% nylon ribstop, regular fit black training rain jacket. White PUMA Cat pigment print branding on right chest and sleeves. Zipped front opening and invisible zipper side pockets. Underarm gusset panel for fit and comfort. Chin guard and 3 piece concealed hood. PLEASE NOTE: Any sizes that are currently out of stock, will be on order with PUMA and should be delivered within the next 21 days.